The standalone Garmin GPSMAP 750 chartplotter features a 7-inch display and comes preloaded with marine charts of UK and Ireland and worldwide basemap. There are two models of the GPSMAP 750, these are the 750 and 750s. The 750s includes a Sounder that requires a transducer (sold separately) which can define depth contours, show fish passing by and measure depth of objects in the water. GPSMAP 750 features touchscreen with multitouch. The screen is easy to read in direct, bright sunlight and the processor is fast allowing for quick panning and zooming. It is also easy to change your course and review information relating to your nautical route. The Garmin GPSMAP 750 and 750s are standalone GPS chartplotters. The 750 features a large multitouch 7-inch touchscreen display. It has been designed to be rugged and waterproof to IPX7 standards to be operated in all conditions and situations. The 750 GPS system includes marine charts for UK and Ireland and also comes preloaded with a worldwide basemap. It also features a built-in high-sensitivity GPS receiver. The GPSMAP 750 makes it easy to plot your route on screen. It is simple to change your course and review information relating to your plotted journey. There are even flexible brightness levels making it daytime readable and it also offers low-light dimming for night time use. Full NMEA 2000 connectivity is offered for engine, fuel, wind, VHF, autopilot and other data monitoring. If you are looking for GPS GLONASS which will update your position on the map every 10 seconds we recommend you purchase the Garmin GPSMAP 750 or 750xs instead. These systems are also WiFi and Bluetooth compatible. Click here to view these products. Also featuring a built-in radar port the GPSMAP 750 can be used with GMR marine radar systems. The radar benefits from a plug and play installation. The GPSMAP 750 / 750s can store 3,000 waypoints, 100 routes, 20,000 points of interest or 50 saved tracks. To find the perfect transducer to partner your GPSMAP 750s and your boat please complete our online form here. Pictured below, transom mounted transducer, thru-hull transducer and in-hull transducer. The 750s model also features a split screen displaying sonar and satellite navigation. The 750s also features a temperature log and graph with the included water temperature sensor. The GPSMAP 750 and 750s come as standard with Garmin g2 BlueCharts for the waters around the whole of UK and Ireland. Additional Bluecharts e.g. France, Iberia are also available on SD/microSD Card. Garmin GPSMAP 750 and 750s marine chartplotters are preloaded with Garmin BlueChart g2 UK and Ireland mapping (pictured right). In future years you can purchase a marine map update SD card to update the preloaded UK and Ireland charts on the Garmin GPSMAP 750/750s. Looking for Garmin GPSMAP 750 or GPSMAP 750s accessories? Accessories available to purchase include 7-inch protective cover, bail mount with knobs and flush mount gasket. If you'd like to add a transducer to your GPSMAP 750s please see this page. Add Garmin BlueChart g2 HD and g2 Vision HD marine charts to your Garmin GPSMAP 750/750s, view the different charts you can buy from ActiveGPS here. 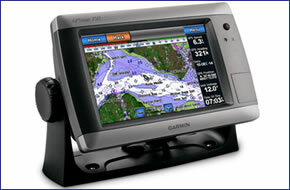 Question: I have a Garmin GPSMAP 750s chartplotter for my boat. I have been told by another skipper, that I can plug in another monitor into the GPSMAP 750s and have charts on one screen and sonar on another screen, when in combination mode. If this is correct what kind of monitor do I use does it have to be a Garman, and where to purchase such a monitor, can you help me? Answer: I think you have been given wrong information. The Garmin GPSMAP 750S was a standalone unit with no capability for adding another display. Compatible and genuine accessories for the Garmin GPMAP 750s can be viewed and purchased online here. Do you have a question about the Garmin GPSMAP 750? Submit your question via our contact page.